Social networking is a huge part of the Internet, providing the means for us all to connect and communicate quickly and easily. There are both positive The Positive Impact of Social Networking Sites on Society The Positive Impact of Social Networking Sites on Society Social networking isn't for everyone, but it's now such a massive part of all our lives, whether we embrace or reject the notion, that it can no longer be ignored. But are social networking sites... Read More and negative The Negative Impact Of Social Networking Sites On Society [Opinion] The Negative Impact Of Social Networking Sites On Society [Opinion] I have accounts on several social networking sites, and spend far too long on them writing my own updates and reading the updates of others. I enjoy doing so, being able to interact with friends,... Read More aspects to the very act of social networking, but most of us take part in the activity on at least a part-time basis. Most of us doing so on more than one site. This complexity of connectivity makes it very tempting to combine the various social networks we use. The mindset being that by integrating them all, one update posts to all of my family, friends, colleagues, and followers. It’s a nice idea in principle, but in practice it’s a potential road to ruin that could result in, at the very least, a severe case of foot-in-mouth disease. Facebook is the biggest of all the social networking sites, with somewhere between 900 million and 1 billion user accounts. Not all of these are active, of course, but it’s an impressive total nonetheless. Facebook is about as mainstream as you can get now, with the userbase veering upwards in age as the number of older people joining makes up for the younger generation moving onto pastures new. Such as Twitter. Facebook requires you to use your real name when joining, making it a place for real people without the comfort of anonymity afforded by other social networks. Facebook is extensively used as a resource for real family and friends to keep in touch. So much so that people I know online have rejected my Facebook friend requests because I don’t know them in the “real” offline world. Twitter is big and growing ever bigger. It went from a niche service to a mainstream behemoth in the span of a few months at the start of 2009. This was when traditional forms of media starting dropping the name into conversation and using the service as a news source. Twitter now boasts 500 million active users, who between them push hundreds of millions of tweets out every single day. Twitter doesn’t require you to be your real self. It’s an optional extra whether you have your account verified or not. Twitter is therefore something of a Wild West in the world of social networks. There is no mutual friending either. You follow who you’re interested in, and people will only follow you if you’re interesting to them. This means you’re communicating with mostly strangers most of the time. 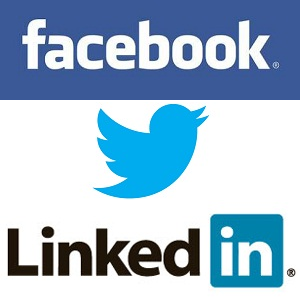 LinkedIn is a social network with a focus on the networking rather than the social. It’s aimed more at a niche set of users than either Facebook or Twitter, if you consider the act of networking in a professional context a niche activity. The smallest of the three, LinkedIn boasts at least 150 million users at the time of writing. LinkedIn has brought to the online world the idea of business cards and introductions that have prevailed in the offline world for many years. LinkedIn is your professional presence on the Web to show to potential clients or partners. And through its network you can make new contacts that may share mutual friends. This is much more about building professional relationships than fostering personal ones. Now that we’ve established the very real differences between these three social networks, it should be obvious to all reading this why integrating your accounts on all of them is not necessarily such a good idea. Writing an update or posting a link/picture/video to one and having it send to all three is a potential disaster waiting to happen. On Twitter you may want to gain followers by posting a tweet intentionally designed to get a reaction. While random people will love the snark, the less tech-savvy family members may take it seriously, and business contacts may balk at the controversial nature of it. On Facebook you may have some personal news that needs sharing with your nearest and dearest. While friends and family will be keen to hear the news, Twitter people won’t care and LinkedIn people may resent what they’ll undoubtedly consider spam and/or utter gibberish. On LinkedIn you may have some important work-related gem to share with like-minded contacts. While those in your direct field of employment will express interest, it will likely go over the heads of all those on Facebook and Twitter. And rightly so too. To sum up in as simple a way as possible: not all social networks are interchangeable, so integration isn’t always the best policy. We all have those off-days where our mouths (or in this case, fingers) engage quicker than our brains, and on those occasions it’s far too easy to send a message that won’t go down well with your contacts on at least one of these sites. Think of this as a public service announcement. Have you already integrated these three social networks? If not do you intend to do so in the future? Let us know your thoughts on the subject, whether you agree or disagree, in the comments section below. I received an email message this week, purportedly from Facebook, but it contained a number of my LInkedIn contacts and their profile pix, including my own, and it came to my business email address which I use for LInkedIn. It was promoting Facebook. Are these two sites intertwining on their own, out of our own reach? I nervously just deleted my Facebook account which is personal in nature and tried to find some mechanisms, to no avail, to restrict Facebook. Would appreciate any info on this. Tks. I've always believed that I should integrate all my social networks, but I totally agree with this article! Thanks for the great post. I integrate with Selective Tweets for twitter. So I can send only selected custom Tweets to Facebook and LinkedIn. I have integrated Twitter and LinkedIn. This article has raised issues I hadn't considered. I sort of integrated the two mindlessly. I need to disintegrate! Disintegrate or dis-integrate? ;) If I save you the headache of offending someone I have done my job. I must admit I've connected Facebook and Twitter but only one way so I'm very careful about the flow of updates. And LinkedIn stands alone. I agree with this article. I have a Twitter feed on my professional blog, only because I only use Twitter for profession-related comments and to share relevant links to like minded people. Thus the blog and my Twitter account targets similar audiences. I have a professional Facebook account where people can like my page, but as this is more for the clients directly involved in my business, I did not link this to my other accounts. On Linked-In, I have a Twitter feed, but it is at the bottom of the page so not really intrusive when people find me on Linked-In. I also have a personal Facebook account with only 30 friends - all family and friends I actually know and talk to in real life. We share photos and personal experiences, so it is a private account. I am sure nobody else will be interested in the fact that our cat just had three kittens! That being said, there is nothing wrong to post some interesting, funny or inspirational things on mainly business related accounts. It encourages interaction, and helps the audience get to know you a little better. You have the right idea, only integrating when you're talking to similar-minded groups of people. You haven't blindly linked all three without thinking about the possible consequences. Thanks for commenting.